Leah Remini is an American actress and producer. She is known for her roles in The King of Queens and The Exes, has competed on Dancing with the Stars, and was a co-host on The Talk. She is currently creating and hosting the documentary series Leah Remini: Scientology and the Aftermath. Remini was baptized in a Roman Catholic Church as a child and was raised in the Catholic tradition. When she was nine years old, her mother joined the Church of Scientology. After this, Remini was raised as a Scientologist. She and her mother moved to Los Angeles when she was thirteen. As she grew up and began her acting career, she was defensive of the Church of Scientology when asked about it in the media. In 2013, Remini left the Church of Scientology, believing that the management was corrupt and that members were being abused. Over the following years, she became more vocal about her reasons for leaving Scientology and how it had affected her life and relationships. She released a memoir in 2015, titled Troublemaker: Surviving Hollywood and Scientology. Remini’s Scientology documentary series, which began airing in 2016, is hosted by Remini and Mike Rinder. The two hosts invite former Scientologists to tell their stories, detailing the abuse, harassment, and relational damage that happen within and result from being part of Scientology. The show has received critical praise, including winning an Emmy and other awards. The Church of Scientology continues to criticize and discredit the series, attacking Remini and Rinder and claiming that they are telling lies about Scientology. 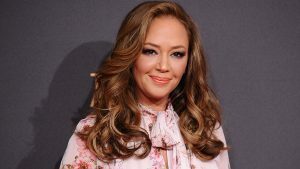 Let’s pray this week for Leah Remini, and first express gratefulness and thanks to God that she is no longer part of Scientology and is using her public platform to try to help those who are being hurt. Pray that she continues to grow closer to God, and that the peace and comfort she feels will deepen even and especially as she works to expose stories of abuse and pain. Pray for protection over her as well as Mike Rinder, and that they will know God is building protection around them despite the threats and defamation they receive. Ask God to continue to give her courage to pursue justice, and that everyone she encounters during this process will experience God’s love and compassion through her. Been praying for Leah and Mike long before I saw this post. Thanks for sharing. They are doing great work. Glad she is on the right path. Hope Mike finds his way , too. For nearly 30 years, I lived about a mile east of the Hollywood Celebrity Center, and every time I passed it (even now) I would pray “Lord, crumble the untruths in the foundations of Scientology and expose them for all to see; make its adherents crave what only Jesus can provide; and take the Celebrity Center property – and the surrounding properties they own – from their hands and give them into the hands of those who will glorify you.” And now Remini & Rinder are actually doing the first part of that! I’ve added protection for them and all their production team to that prayer.